In this election season, much ado will be made over tax cuts, tax rates and the fairness of taxes on the poor versus taxes on the wealthy. The information above, straight from the Congressional Budget Office should lay to rest the effective tax rates of the different levels of income. The effective tax rates above include all federal taxes (income, payroll (FICA/Medicare) and corporate). This data is from 2004, the tax code hasn't changed much since then but for reference, the FICA rate in 2004 was 6.2%, Medicare rate was 1.45% and the FICA limit was $87,000. I ask that you read my entire post before responding, you may take something one way when you read it, but another way when you've read the entire post. 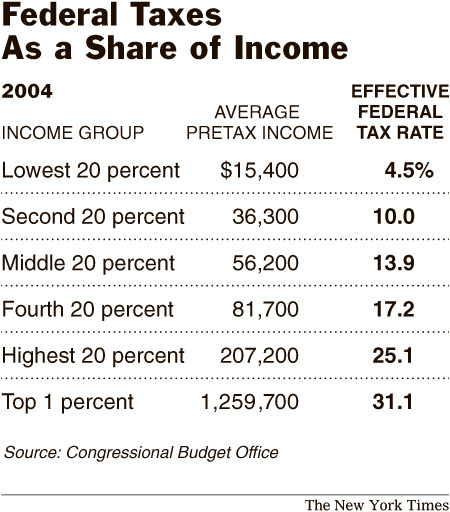 The fact that the tax rates for the lowest 20% are below the FICA rate shows that their federal income tax is negative. This is most likely due to Earned Income Credit. This is what enables people to pay in almost no federal income tax, yet receive a $3000 refund. And the 2nd tier (up to $36,000) is paying very little over the 7.65% FICA/Medicare rate. These are the two groups usually referred to as the "working poor" that politicians love to drag out and whine that they barely got a tax cut while the "mega-wealthy" got a huge tax cut. Well, if you aren't paying federal income tax to begin with, how much of a cut can you get? The middle class is made up of the next 2 groups ($37,000 - $81,000). These two groups are paying 13% and 17%, respectively, of their income to the federal government. Something that is true for all groups, but probably most pronounced in this group is the difference between 2 married people earning the money versus a single person earning the money. I pay more in taxes as a single person than my ex-wife and I combined when I was married and our combined income was 50-60% more than it is now. Then the top 20% is paying 25% of their income. Keep in mind, this is before state income tax (which Tennessee thankfully does not have), state sales tax (where TN makes up for not having an income tax), county/city sales tax, wheel tax, property tax, utility tax, permit tax, fuel tax, all those taxes listed on your phone and cable bill, pet tax, toll roads, etc. The table includes the top 1%, which is already factored in to the highest 20%, but it is interesting to note that the effective tax rate is 31.1%. The effective tax rate for that group is 25%, so you have to assume that the lower incomes in that group are paying quite a bit less than 25%. I created the table below, which shows the percentage increase in average income and the percentage increase in tax rates between the groups. This shows that the average income increases faster than the tax rates. Does this mean the tax system is not progressive enough? I don't think so, keep in mind this is comparing 2 different types of numbers. The income amount is an average while the rate is the effective rate for the entire group, not an average for the group. What this table does not include are those tax payers who do not draw a paycheck. If most of your income comes from capital gains and dividends, you would only be taxed at 15% and they are not subject to FICA/Medicare taxes. This is one of the favorite whipping posts for the crowd that complains about "tax cuts for the mega-wealthy." I don't know how many people actually earn the greatest portion of their living this way, but I imagine it's not a very large group. The article quotes Bush as saying "On principle, no one in America should have to pay more than a third of their income to the federal government." My question to that quote and all the data mentioned above is: Who's principle? Where, exactly, did he pull a third as the correct maximum amount of tax? Let's look back to 1916 when the income tax was enacted (well, the 3rd and last time it was enacted), the rates went from 1% all the way up to...7%. Less than 1% of Americans (the top earners) paid income tax. Fast forward 90 years and we have teenagers working part time at McDonalds paying income tax and the president thinks no one should pay more than 1/3 of their income and there are people who don't think that is enough! So what is enough? How much of your income do you think the federal government has the right to take from you before you even receive it? This post is full of numbers and percentages and comparisons between income levels. You could take the numbers I provided and argue that our tax system is progressive and that the rich pay significantly more in taxes than the poor. But you could also take the same numbers and present them a different way and argue that the system isn't progressive enough and the rich don't pay enough. I didn't provide the numbers to argue either one of those things. I provided them to prove my point. My point is that using numbers to argue a moral and philosophic question is a waste of time. Look back at the numbers, you could add 10% to every percentage listed and we could still have the same debate about who's paying their "fair share." Add 20%, 30%, where does it stop? Why is 1/3 of my income the most I should pay? Why not 1/2? Why not 1/4? There are no fractions in ethics and morality. If the government of the United States thinks that they have the right to 1/3 of my income, then they think they have the right to 100% of it. Let's not ignore the privacy issue brought about by the income tax. Before the income tax, employment was a private matter between an employer and an employee. How much you made was between you and your employer only. Now, you can't work without filling out a bunch of forms and by the time you get your first paycheck, there are 5 or 6 government agencies that know exactly how much you make. Also, think about all the exceptions I mentioned above. All the different rates and differences between single and married, parent and childless. The tax code is huge and has created an entire industry that exists just so normal people can file their taxes. And God forbid you file them wrong, get ready to pay serious penalties or worse, lose some property. And if the "taxes aren't progressive enough" crowd is so up in arms about taxation, why aren't they willing to talk about the most regressive tax of all, FICA? FICA and Medicare taxes everyone at 7.65%, with an additional 7.65% begin paid by the employer. And to make it even more regressive, the FICA portion (6.2%) stops after $94,500. Why isn't this group willing to look at reducing or eliminating these taxes? Because they fund the ultimate nanny-state program, Social (In)Security. The sad thing is, politicians won't talk about taxes like this. There seem to be only two schools of though: 1) lower taxes for the middle class and poor and make up the difference by taxing the rich (often the definition of rich here means those making over $75,000 a year which is a long way from rich) and 2) tax cuts for everyone! No, we don't need to reduce spending, we'll collect more from taxes because the economy will improve. I've got an idea, how about we really, I mean really, cut taxes and cut spending til we're only funding what the government is constitutionally allowed to do and everyone will have more money. Sure there will be a brief economic downturn for all those government employees out there, but they will get swept up in the booming economy that would follow such drastic tax cuts. There is only one candidate running in the 2008 primary that is willing to talk about taxes in these terms. That candidate is Ron Paul. I swore on this very blog that I would not vote for a Republican or Democrat again. I am revising that statement. Ron Paul is not really a Republican. He has ran on the Libertarian ticket before and his views align more with the Libertarian Party than the Republican Party. I am going to vote for Dr. Paul in the primary (as of right now, future events may change my mind). My theory (caveat: with my non-mainstream views, any political analysis of major candidates by me is apt to be completely and utterly wrong) is that Dr. Paul is the only hope the Republican party has at winning the presidency. Based on the current approval ratings of our current despot, the American people aren't going to go for Ghouliani, Tancredo, Romney or any of the other Bush clones who want more war and torture and less rights. And how can anyone forgive McCain's involvement in the McCain-Feingold bill, one of the biggest affronts to free speech in recent history? So we're down to the district attorney from Law & Order, Fred Thompson and Dr. Paul. From what I know of Thompson, he talks a good game about the Constitution, but he falls into the party line on a lot of issues, so the left will see him as just another R.
Historically, you've got 40-45% voting D and 40-45% voting R no matter who is running. It's the 10-20% of swing voters that truly decide an election. If, and this is a big if, Dr. Paul were to win the Republican primary, then the Libertarian party would be best served by not running a candidate and throwing their support behind Dr. Paul. With their support and enough of those middle of the road voters who don't go third party, he could win the election. I think with any other R candidate, everyone will see it's going to be more of the same and those 10-20% swing voters will cross to the D side so fast, the boat might tip over. I have been supporting Ron Paul since his decision to run for the GOP ticket. I love his stances on NATO, the UN and the IRS. However, as time has gone by, I have decided that an alternative candidate has little to no chance of winning a major party nomination, let alone an election. I believe it is time to heed the words of Thomas Jefferson... "The tree of liberty must be refreshed from time to time with the blood of patriots and tyrants." I believe the American political system has failed the electorate. Not only is the average citizen not properly represented, but his constitutional means for addressing such a shortcoming has been whittled down to a farcical version of its former self. I believe it is time for the American people to rise up and begin again with a true republic, one that is concerned more with its own governance than with the interests of private business; more with its own responsibility to its citizenry than empire building abroad; more with the further growth of the opportunities afforded by the Declaration of Independence than the minutes of United Nations meetings. Every man should exercise his right to bear arms and demonstrate to his leaders that the Second Amendment was put in place to insure that the United States Federal Government should never hold sway over its populace, but be beholden to it. Tommy J warned us that foreign entanglements, banking and a general apathy toward the affairs of Washington would lead us into the very world from which our forefathers escaped. Let us all rise up and denounce with great fervor and militant declaration that we will no longer tolerate the misrepresentation, theft and feudal despotism to which our government has grown accustom.